Do you know a little girl who just can't get enough of Frozen's signature song, Let It Go? Then you know she'd absolutely love this amazing singing t-shirt! Say what?! 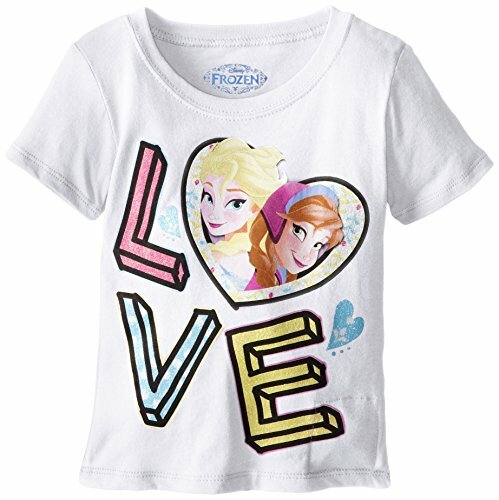 This fun t-shirt has a unique cartoon-style design featuring the faces of sisters Elsa and Anna inside the heart-shaped letter 'O' in the word LOVE. This is a sharp screen-printed image using glittery vibrant colors. If the fun original design isn't enough, though, you won't believe what this shirt can do -- it sings! Just press the small sewn-in button to hear Elsa sing her famous song LET IT GO. This highly rated singing Frozen shirt comes in sizes for girls from toddler size up through 5/6. It's made of 100% cotton and machine washable. Other pastel colors are also available.